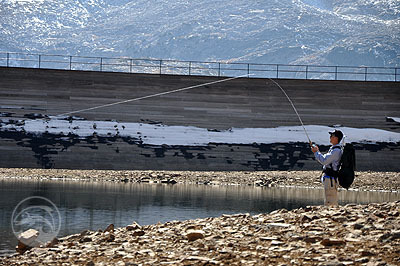 Introduction: Shimano introduces a brand new line of ultra durable rods under the new "Voltaeus" series. These rods are designed to be extremely durable yet also extremely lightweight. To do this Shimano turns to an exclusive proprietary new construction that fuses carbon and T-glass together to form a light, sensitive, and extremely durable rod. The birth of the Voltaeus started with a simple idea and a simple question... why does "very durable" have to mean "very heavy?" Most of the competing rods were not only heavy but lacked sensitivity. The team at Shimano fished a lot of these rods and their overall consensus was to this point in rod building history was that durable does often relate to very heavy glass rich fishing rods that have little sensitivity and very little application character. The Voltaeus features a silver blank that is constructed out of "Unifiber"
So what does "Voltaeus" mean.... a discharge of energy that creates an arc, an appropriate name for a rod designed to take serious stress under load. Shimano makes use of "Unifiber" in the Voltaeus construction. Unifiber is a new Shimano exclusive proprietary construction that uses carbon and T-glass and fuses them together to create an incredibly light, sensitive, and very durable rod. In terms of components Shimano uses stainless steel guides for corrosion resistance, these guides are well suited for use with braided line (makes sense as the company has just acquired power-Pro) as well as monofilament. The custom graphite reel seats provide secure reel placement as well as decreased overall weight. The Voltaeus line looks like it is aimed squarely against the popular Ugly-Stik rods, and there will be a total of 29 rods in the lineup so there is a Voltaeus rod for everything from fishing for panfish and trout to striped marlin! In terms of cosmetics the rods feature a sliver blank that matches nicely with many of Shimano's spinning and lower baitcasting reels. Perhaps best of all is that the Voltaeus rods are an exceptional value with rods in the lineup starting at only 39.99 and going up to 59.99 for the robust saltwater models. The Shakespeare Ugly-Stik rods come backed with the "Ugly Back" warranty on freshwater rods which is 70day/7-years and a 60-day/5 year limited warranty on all other rods. 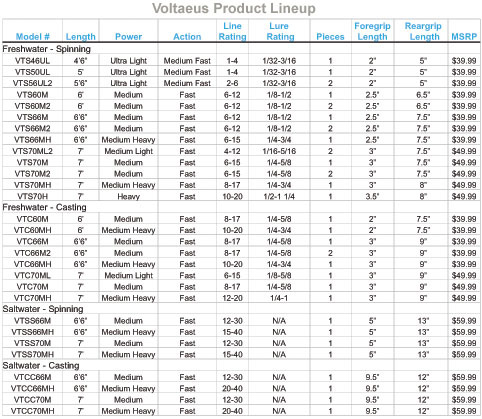 How does Shimano's Voltaeus stack up? In an unprecedented move for the price point Shimano back's their line with a limited lifetime warranty on all rods in the Voltaeus lineup. Conclusion: The Voltaeus rods are becoming available now and Shimano is also launching a competition/contest surrounding these new rods in just under 7 hours at the time of this article. For now there is a countdown meter on their promotion site under the title the "Ultimate Hook-Up" Shimano's Marketing Manager Cody Herman hinted that the contest would give prizes to anglers that catch fish using the new rods. While we are very curious in what the contest has to offer anglers we are sure that the Voltaeus rods already offer anglers a great value. 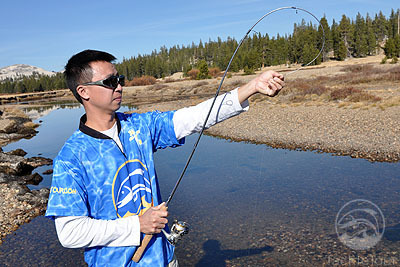 The team has been fishing these rods for over two months now and while we have not completed our field tests we can disclose that the rods have survived a barrage of field and stress tests including fishing for Alpers, deliberate high sticking, door slams, and yes...even getting run over with a car. 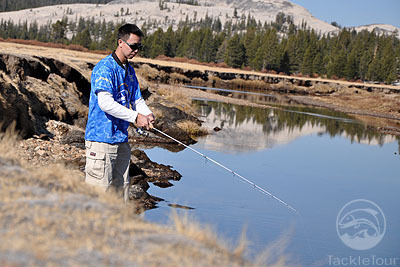 We have found the Voltaeus rods excellent for the specific applications they are designed for including cranking as they feature forgiving tapers and we even employed a Voltaeus trout rod to target brookies in the High Sierras (check out our fishing for brook trout video to see JIP fishing with the rod.) With the economy being of real concern to everyone, anglers included, the new affordable yet highly durable Voltaeus rods are an exciting new introduction that gives anglers tough rods that are also designed to be a pleasure to fish with.